Colonization of Africa - How did the Scramble for Africa led to Decolonization? 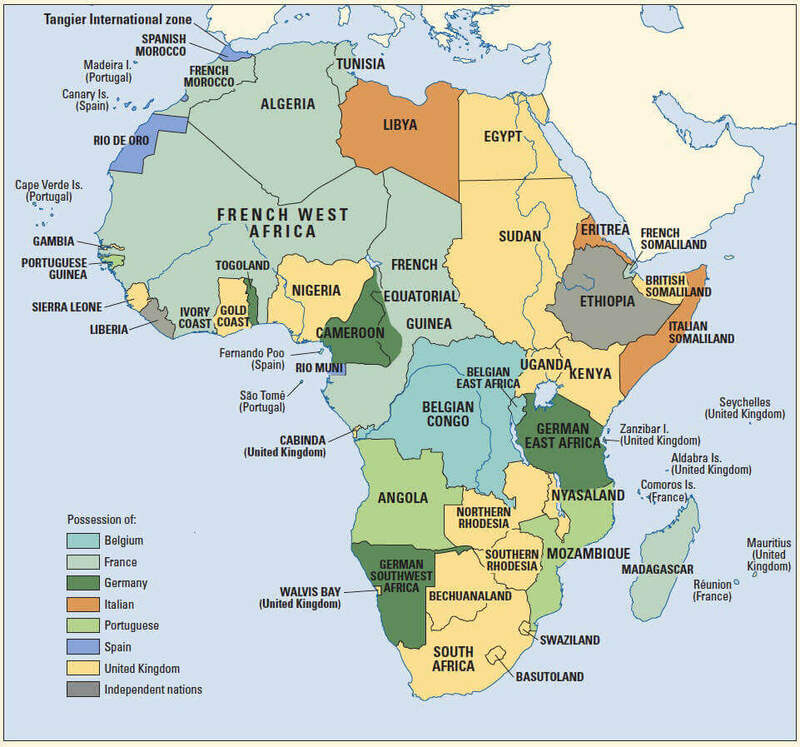 Colonization of Africa – How did the Scramble for Africa led to Decolonization? 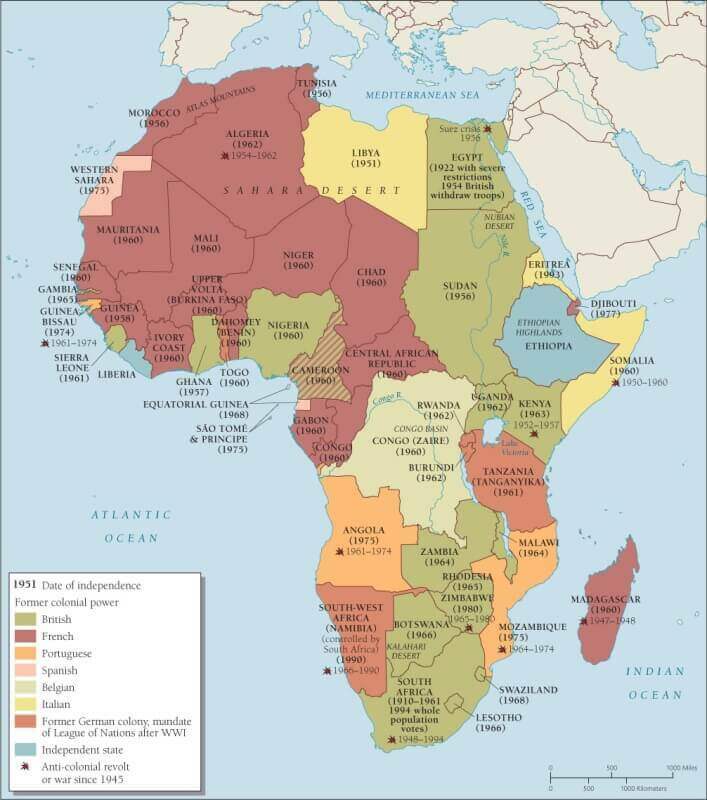 The Colonization of Africa: During the 19th-20th centuries, the African continent was colonized mainly by European powers like Britain, France, Spain, Portugal, and Russia. Colonialization is the action by which a foreign power occupies another country, and then exploit the economic resources of the occupied country for benefit of their native land (foreign country). What led to European Colonisation in Asia and Africa? Following the occupation of Constantinople by Ottoman Turks (1453), empires of western Europe (Spain and Portugal) was forced to find alternate sea routes to the East (China and India). These empires were later supplanted by the industrial powers – Britain and France. Germany and Italy also entered the scene towards the end of the nineteenth century. They stumbled upon the Americas (Columbus, 1492) and realised the huge potential of controlling colonies through which they can source merchandise for trade cheaply. This led to establishing trade routes with countries of Western Africa, India, Dutch East Indies (Indonesia) etc. Since they controlled the high seas, they were able to influence the trading policies of these countries. This gave them the incentive to interfere in the domestic politics of these countries. It is broadly divided into two phases – Mercantile and Industrial phases. This is called as Mercantilism because the major motto of colonial powers was to establish supremacy in trading relationships. They sought to source merchandise cheaply and sell it at a premium in European markets. They controlled high seas and used this as a means for ‘Gunboat diplomacy’ and later establishing extensive empires in the Americas, East Indies (present-day Indonesia) etc. The technological superiority of Colonialists wasn’t as much as in the later industrial phase. So they were able to subjugate only relatively primitive peoples. Countries with well-established state systems and cultures were able to repel colonialists. (For example, in India, Mughal emperor Aurangzeb defeated British East India Company in Child’s War, 1686. China wasn’t attacked till the Opium Wars of the nineteenth century). Goods from the east were still in great demand across Europe. So they worked under the trading systems laid by the strong states of India and China. This coincided with the Industrial Revolution in Western Europe and the United States of America. The relative technological supremacy and decadence in the Eastern states meant that Europe could interfere in the internal affairs of these states. European states used gunboat diplomacy (Opium Wars in China) as well as vile political machinations (Bengal in India, leading to the Battle of Plassey, 1757) to secure their aims. Apart from trade, they sought to secure vast markets for the new industrial goods produced through the Industrial revolution in these countries. Political influence gained in these countries were used to destroy traditional industries and promoted cheap, mass-produced European goods. Eg: Destruction of the famed textile industry of Bengal by the British to promote cheap cotton from the textile mills of England. Colonies were used to source cheap raw materials and value-added manufactured goods were dumped in the colonies under the banner of “Free trade”. The colonial powers controlled foreign, monetary and trade policies. This meant an advantage to the industrialists at home. This led to the famous drain of wealth from the colonies. Colonialism reached its logical conclusion with the rise of new industrial powers in Europe – Germany and Italy. This lead to a competition for accruing larger and larger empires that meant more power and prestige to these countries. This was most pronounced in the tragic event of Scramble for Africa. This happened during the period of New Imperialism (1881-1914). Increasing rivalry between European powers – Britain, France, Germany etc – meant that they needed more and more markets and sources for cheap raw material. Technological progress – mapping of inland Africa in the middle decades of the nineteenth century, advances in treating deadly diseases like malaria etc – meant that the European powers could finally move inland from the well established coastal colonies. But this would require costly wars against the native population. So they reached a political settlement where they divided the territory of Africa within themselves with no regard for the wishes of the indigenous people of these lands! The settlement was reached in the Berlin conference of 1884. In 1870, less than 10% of African territory was under European control. By 1914, it had increased to almost 90%! This is known as the scramble of Africa. It was the cultural, economic and political process through which colonies broke free from the colonial empires and integrated themselves to the new ‘world order’. Colonial empires were generally founded on principles of Racism and ‘right to rule’ over ‘inferior races’. These narratives had to be challenged. The self-confidence of people had to be boosted. Exercises of cultural integration and the creation of national identities and a shared past were emphasised. Eg: Ancient Greek (Hellenistic) culture was emphasised in the Greek War of Independence, 1829 against the Ottoman Empire. In India, achievements of our ancient civilisation were popularised. Most states were successful in this regard, though deep-rooted tribal differences and prejudices led to problems in Africa (see below). Newly freed states had to be allowed to follow an independent foreign policy. They had to raise resources and build stable institutions (Eg: An Army subject to strict civilian control). Representative and democratic institutions needed to be built. This needed an enlightened citizenry and an empowered leadership. The old European powers sought to exert influence in newly independent trades through biased trade policies. This came to be known as Neo-Colonialism. Most of the investment in these countries came from the erstwhile colonizers. So they were able to control new governments through lobbying and other informal (often corrupt) means. Colonial powers were technologically advanced. So they used it as a leverage in directing foreign investment and hence controlling the new states. They sought to guard their technological supremacy through tight Intellectual property regimes. 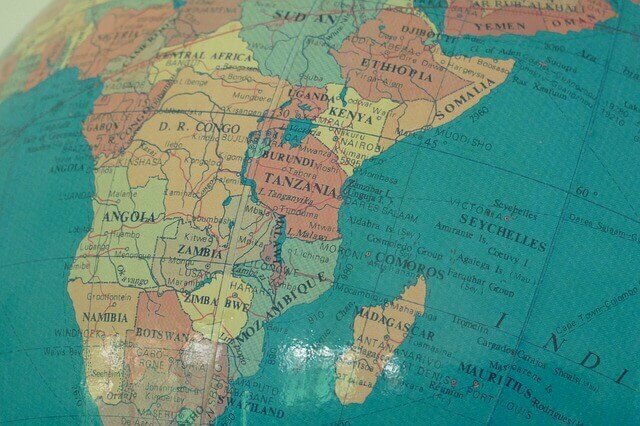 In this article, we look at how the newly formed states underwent the process of Decolonisation in Africa. What forced European powers to abandon their empires? Nationalist movements – Through the effects of westernisation and opening up, colonies acquired enlightened leadership and many developed strong nationalist movements. Most colonies were extensive police states. Massive unrest made them simply unviable. Second World War: It weakened most European powers and they couldn’t keep up with the maintenance of their empires. The most powerful among victorious powers – The USA and the USSR took a firm anti-colonial stance. This further weakened the Europeans. Pan-Africanism: A feeling of brotherhood was growing within the indigenous people of Africa. This meant a pooling of resources and external support in the struggle for independence. As more and more countries attained freedom, the entire process was hastened. Outside Pressures: The USA and USSR actively pressurised colonial powers. Eg: President Truman of the US pressurised British government to make India independent. Newly formed United Nations and other powerful international associations like the Non-Alignment Movement built up firm international opinions against colonialism. Africa faced many unique challenges which made Decolonisation a very difficult process. These were common to most of the new states in Africa. Tribal differences: Many countries were brought together by the sheer military forces of the colonizers. Lack of a common cultural past and tribal belligerence meant that they slaughtered each other inside these artificial boundaries imposed upon them. This led to worst genocides in Nigeria, Congo (Zaire), Burundi and Rwanda. Cold war rivalry: Since most of them were resource-rich, the two major blocs didn’t want more states slipping into the orbit of its rival power. This led to prolonged civil wars. Eg: Angola, Uganda, Burundi etc. Economic underdevelopment: Colonisers used them as sources of raw materials. So lack of industries and primitive agriculture made them susceptible to Neo-Colonialism. Also, most of their economies were entirely dependent upon the export of one or two commodities. When international prices fell, they plunged into political instability and civil wars. Eg: Nigeria, Ghana, Tanzania, Burundi etc. Political and Social problems: Most colonial powers refused education to Africans. This led to the deficiency in enlightened leadership and a general faith in democratic means. This meant that most countries plunged into corruption and civil war soon after independence. Economic and Natural Disasters: Devastating famines of the 1980s and ongoing famines due to climate change are spelling disaster to these countries. These events end up ruining economies and destabilising governments. Through the 90s, the spread of the HIV/AIDS epidemic also posed a grave threat to these countries. During the last two decades, climate change-induced disasters are seen to affect third world countries, especially those in Africa. Ethnic conflict: In some countries with an influential white settler population, Decolonisation was a more complex affair. They offered firm resistance because they were privileged under the old system. Eg: Rhodesia (Zimbabwe) and the erstwhile Apartheid regime of South Africa. Sometimes, as in Zimbabwe, forced taking away of estates from the white minority led to an overall fall in productivity and caused economic crises. Religious Extremism: This is a fairly recent phenomenon in which Islamist ideologies taking over Muslim populations of these countries. Eg: Boko Haram in Nigeria, Al-Shabab in Somalia. Due to these challenges and specific conditions in different countries, Decolonisation turned out different results for these countries. Army coups were common in countries with weak leadership and limited mass base in democratic processes. Eg: Ghana, Nigeria, Uganda, Burundi, Rwanda, Congo etc. Complete export dependency on one or two commodities leading to instability at times of falling prices. Eg: Nigeria, Ghana, Tanzania, Burundi etc. Extreme poverty was the characteristic of most states due to lesser human development and corruption. Rampant corruption – most states fell into the hands of a corrupted elite that exploited social fissures to enrich itself. Recently we saw popular movements against Robert Mugabe of Zimbabwe and Jacob Zuma of South Africa succeeding in removing them. Great power rivalry has affected many states like Angola badly. At the same time, these powers failed to interfere in places where their interests were not involved. Eg: Failure to stop the Rwandan genocide of 1994. This points to the need for a pan-African movement to ensure democracy and rule of law. Resource-rich countries falling prey to Neo-colonialism and sectarian violence. Eg: Sierra Leone is locked in a perpetual civil war over its gold, diamond and iron ore deposits. China is accused of adopting Neo-colonial policies to exert influence over resource-rich Western Africa. The recent effort by India and Japan to build an Asia-Africa Growth corridor is seen as an effort to counter this. Many North African countries saw widespread protests at the time of ‘Arab Spring’ of 2011. Eg: Morocco, Tunisia, Libya and Egypt. But due to lukewarm responses from the outside world, many of them either fell under the influence of Islamist ideologies or were quelled through extreme violence. This was an opportunity lost in bringing democratic governance to entire northern Africa. After Indian independence, India supported Decolonisation strongly in International fora through the leadership of Non-Alignment movement. India actively mobilised international opinion in favour of Decolonisation. In Indonesia and Africa, it was vocal in support. It also sent troops to solve the Congo Crisis of the 1960s. Besides, India contributes actively to the UN peacekeeping forces that operate in different parts of Africa. Decolonisation was a force of good that helped liberate billions of people across the globe from exploitation under an oppressive foreign rule. As a cultural process, it is continuing to date. It ended up with the majority of the world achieving self-determination and self-rule. Though the hegemonic nations still exert large influence through international trade, investment and technology control, these countries are free to script their own destiny. Majority of the so-called “Third world” is still mired in extreme poverty. The way forward is through human development, the spread of education and building of institutions through regional (Pan-African, Pan-South Asian collaboration etc) cooperation. Work of UN agencies is commendable in this regard. UN General Assembly has emerged as a potent forum where world opinion is mobilised in favour of third world countries. Its powers and influence have to be enhanced. The democratisation of international order will help the third world more in getting its grievances addressed and in building a more equitable world. if it would be getting in every topic wise question and answers then self preparators are helpful because world history is a tough subject.